Brief: A beautiful kitchen renovation for one of our private clients in Rustington area carried out by our professional team of builders. 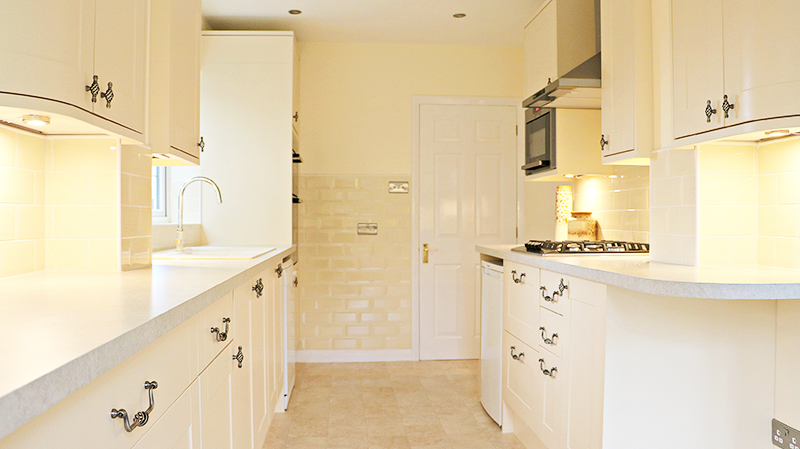 PH Beck Building Contractors have an extensive knowledge and experience in renovating kitchens all across Sussex area. Always focusing on the needs of the customer, we also aim to carry out the works in the most efficient and eco-friendly manner. Consequently, we are constantly providing our services to the public sector. However, we always welcome any enquiries from private clients. We were delighted to meet Mrs H from Rustinghton and provide a full consultation on what we can offer. After a successful discussion about kitchen design, work programme and Health & Safety, we have been invited to proceed with the refurbishment. Our client has decided to go for an elegant and modern design, which would be easy to manage and maintain. After stripping out all the materials, our skilled team of builders began installing carefully picked high quality fixtures and fittings in a clean, professional manner. In the meantime, our directors have focused on managing the works by responding to our clients requests and keeping close in touch. The result? An exemplary kitchen, happy customer and a complacent contractor. PH Beck Building Contractors have an extensive knowledge and experience in renovating kitchens all across Sussex area. Always focusing on the needs of the customer, we also aim to carry out the works in the most efficient and eco-friendly manner. Consequently, we are constantly providing our services to the public sector. However, we always welcome any enquiries from private clients. Our client has decided to go for an elegant and modern design, which would be easy to manage and maintain. After stripping out all the materials, our skilled team of builders began installing carefully picked high quality fixtures and fittings in a clean, professional manner. In the meantime, our directors have focused on managing the works by responding to our clients requests and keeping close in touch. The result? An exemplary kitchen, happy customer and a complacent contractor.